An excellent fold-out visitor's map (scale 1 : 2 750 000 for the Antarctic Peninsula Region and 1 : 12 250 000 for the Antarctic Continent), that measures approximately 100 x 69 cm (W x H) when unfolded. On one side there is a map of the Antarctic continent, around which succinct biographies of Antarctic explorers from William Spiers Bruce to Edward Wilson are shown. 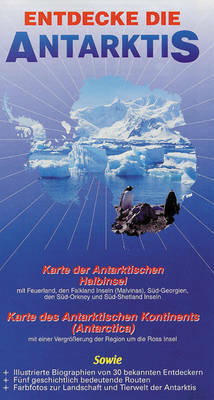 On the other side there are many fine colour photographs of seals, penguins and other Antarctic wildlife, together with an inset box summarising the Antarctic Treaty and other information on Antarctic waters, Cape Horn, Tierra del Fuego, the Beagle Channel, the Falkland Islands and South Georgia. Aimed at visitors arriving by sea.